Recently the 20th anniversary of the Esso Longford disaster was commemorated in Victoria. 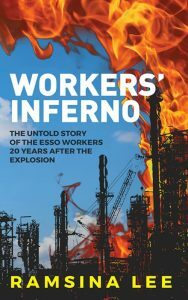 Coinciding with this anniversary was the release of a book about the disaster and its personal aftermath, Workers’ Inferno, written by Ramsina Lee. This book has been in development for many, many years and the Lee’s writing talent is on display in the structure of the book and the stories within. These stories largely linear But the multiple strands allow Lee to jump from one to the other providing a variety tone.